This flute duet was composed shortly after the 9/11 Twin Towers tragedy in the USA, when the whole world seemed to be in a state of shock and grief. We all seemed to miss a few heart beats, as we surrended our innocence to a harsh and threatening reality, as well as mourning the loss of so much human potential. 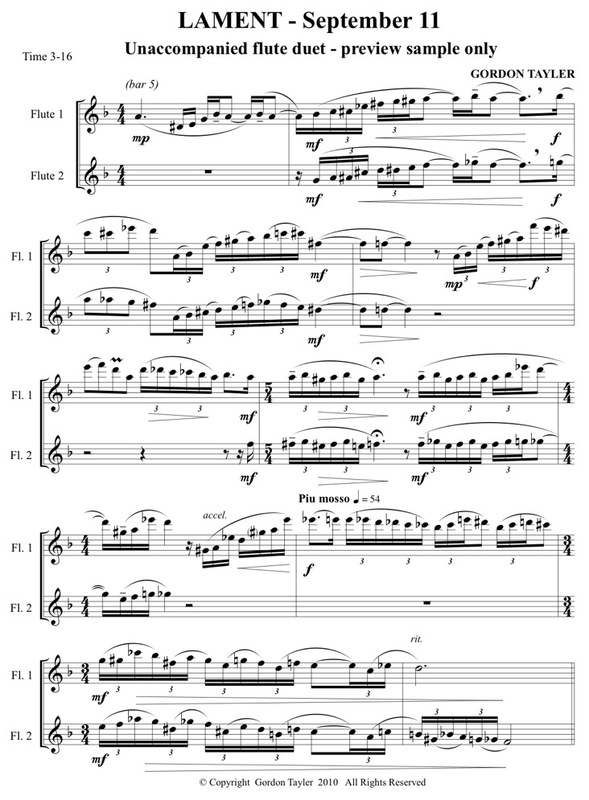 The flutists need to listen carefully to each other so that the sense of rubato or fredom in the time does not break the ensemble connection of the flute duet. The staccatto section needs to be played with attack and shortness, and careful dynamics. Taper phrase ends, pushing the lower lip forward to raise the air angle – this prevents flatness as the notes soften. This is difficult to do in duet, but very satisfying when you get it right.